Are you pregnant and considering an abortion? Do not abort your unborn child! There is a better way. You may be visiting our website because you are overwhelmed by an unwanted pregnancy. Perhaps you do not have support from the baby’s father or the rest of your family. You may also have financial pressures, school or work concerns or other problems that lead you to believe that abortion is your only choice. This is a lie! There are always better solutions to a difficult pregnancy. Please read on. The abortionist will not tell you the whole truth about the abortion. The abortion clinic staff will say, “It is only a blob of tissue. It is nothing.” That is the message of most abortion doctors. The clinic wants you “not to worry” or think deeply about what you are doing because then they will lose their money. Of course they want to hurry you through the process before you realize, “What have I done?!! !” and then it’s too late. Do not allow them to trick you or deceive you. Do not give into pressure from them or other people in your life. Do not make a decision based on problems that feel overwhelming now but which will pass in time. Many people will tell you that this pregnancy will ruin your life but countless women who have aborted will tell you that their abortion was far more ruinous than their pregnancy could ever have been. Read these testimonies from women who visited our website: https://www.abortionno.org/testimonies/. You are the one who must live with your decision forever. We urge you to look beyond your own concerns and consider the smallest person involved in your choice. Ask yourself: What is pregnancy? You know in your heart that a pregnancy means you are carrying a child in your womb, or perhaps even twins! Then you must ask: What is abortion and what does abortion do to the baby? Our website clearly shows you the reality of abortion. https://www.abortionno.org/abortion-photos/ These abortion pictures show that an abortion is an act of violence that kills an unborn baby. Your baby wants to live! Look at this footage of babies in the womb. This is what your child looks like at various stages during your pregnancy. http://www.ehd.org/movies.php?mov_id=47. All of his body systems are present by eight weeks. A three month old unborn child responds to light touch, so imagine how excruciating your baby’s pain will be if you chose to abort your child. I hope you will have the courage and integrity to see the above web images as well as the following link where you will hear a verbal 1st trimester abortion description from a priest friend of ours: http://www.youtube.com/watch?v=QBOAPleF1t0. This will give you more truthful knowledge of what an abortion entails. Then you will not go to the abortion facility blindly and submit yourself and your baby to the indignities and indecencies of that hideous place. No matter who is the father of this baby and regardless of the circumstances of your pregnancy, this is still your child, genetically linked to you and a forever part of your family history. It is now your choice to give your baby life or to violently end your baby’s life through an abortion. You may become infertile as a result of damage done by the abortion. Some women experience infection and scarring in the reproductive system that renders them unable to ever again conceive or carry a pregnancy to term. You will feel stabs of pain when you see pregnant women and babies. They will remind you of the child you aborted. You will have a difficult time bonding in a healthy way with future children, if you are so blessed to have them. The abortion will always be in your mind and you will wonder if those children will learn that you aborted their sibling. Your relationship with your boyfriend or husband will likely end. One study showed 90% of relationships end after an abortion. You will face nightmares about your abortion and you will likely engage in self-destructive behaviors such as excess drinking, drug abuse, eating disorders, promiscuity and even suicidal acts in an effort to cover up your pain. This is only a sampling of the grief that occurs after every abortion. Teens and young women often go into denial after their abortions and effectively mask the pain for years. But it will come out someday. For personal online help, e-mail Lois@cbrinfo.org and write “HELP” in the subject line. If you can gather the courage and strength to carry your baby to term, but don’t believe that you are at a point in your life where you can parent him, there are thousands of loving families waiting to adopt children. Here are some links for you to begin researching this loving option: http://www.nightlight.org, mayweadopt.com, and http://www.impregnant.org/. We were all once in our mothers’ wombs. No one had the right to kill us. In conception a new, unique individual is created. That is a medical and scientific fact. So we plead with every pregnant woman: please do not kill your unborn child! To every man who made a woman pregnant: please don’t force her into an abortion. Every abortion leads to pain, sorrow and/or regret in varying degrees. But no one regrets a child. 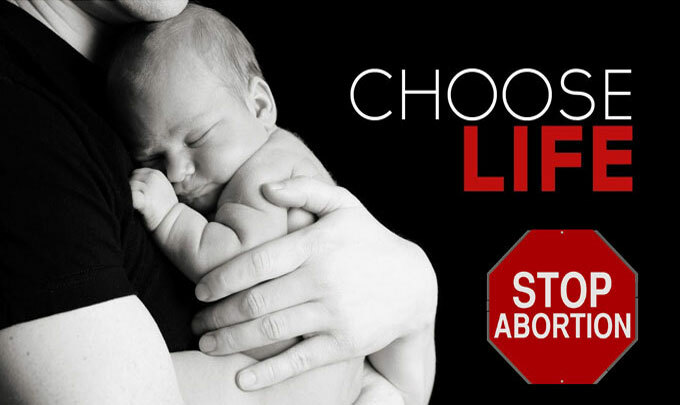 So please choose life for your baby!